Two words to describe the perfect slice of cheesecake: pure decadence. I'm talking about the type from your neighborhood bakery or your favorite restaurant. Made with rich, creamy, delicious cream cheese. I do allow myself that indulgence once in a while but I have created the perfect recipe for when these cravings happen at home. Actually, I had not initially set out to create a healthy cheesecake recipe; I was looking for a way to incorporate tofu in dessert. Tofu is so versatile but up until recently, I shamefully had only ventured to use it savory dishes. All that has changed. I can imagine some people will gag at the thought of a tofu cheesecake and I want you to know I understand these reservations. At first, some things seem not to go too well together. For example, chocolate and chili, basil and ice cream, honey and mustard, Minnesota and summer (just kidding!) However, the result of these odd couples are very distinct and pleasing taste sensations. Once you have tasted this cheesecake, you will notice two things: (1) it doesn't taste as though it contains tofu, and (2) the texture is both light and creamy. Besides being a great dessert, this recipe is a good way to get more protein in your diet. Protein from dessert? Who would've thought? In a food processor, grind pecans and graham crackers. Empty into a mixing bowl and add vegetable oil, egg white and orange extract. Mix well. Press unto the base of a well greased 8" spring form pan. Bake at 350 degrees F for 10 minutes. Remove pan from oven and set aside. Reduce oven to 325 degrees F.
Using a blender (see note below), blend together all of the filling ingredients until a smooth, silky consistency takes shape. Pour onto crust in spring form pan, and bake at 325 degrees F for one hour. Remove from oven and immediately pass a knife along around the sides. Place cake in pan on a wire rack and cool for 30 minutes. Chill overnight in refrigerator. Remove sides of pan. In a heavy saucepan, heat clementine juice, water, honey, corn starch, and orange extract. Whisk rigorously and cook for 10 to 15 minutes until mixture begins to thicken. Remove from heat and allow to cool thoroughly. Once syrup has cooled, evenly spread two tablespoons onto top of chilled cheesecake. 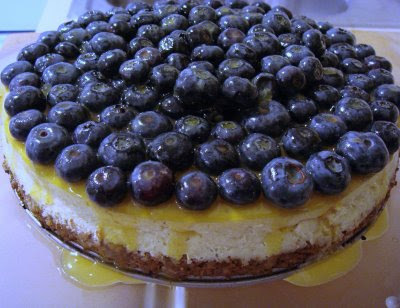 Toss the blueberries in the remaining syrup and arrange them in a decorative pattern on top of cake. Any remaining syrup should be drizzled over finished product. Note: I strongly recommend using a blender to make the filling as opposed to using an electric hand or stand up mixer. The mixers do not produce the smooth, silky quality necessary for the filling. What they do produce, however, is a filling with a lumpy, unattractive texture. I hope this serves to deter you from using your handy dandy mixer, just this once. It looks beautiful and delicious! I love blueberries especially in desserts! thanks for visitng my blog, natasha. ya i knw, there is nothing like warm bread right out of the oven. This looks great. I really envy you your summer blueberries! Woooooow! Nice dish and nice blog dear! So, I'm a new follower. Please, visit my blog too and come on to know a little bit of the brazilian cook. Thanks Luiz! Consider it done!